Jenna's Giveaways and Reviews: Stella & Dot Giveaway & Trunk Show! Stella & Dot Giveaway & Trunk Show! I am so excited about this next giveaway! Tahnie has been more than patient with me while I've been dealing with medical stuff and trying to get this post up! I am so thrilled to be hosting a virtual Stella & Dot jewelry trunk show! They have something for everyone from gorgeous statement necklaces to everyday completely customizable charm necklaces. The best thing of all about this trunk show is that 30% of the proceeds will benefit ACH (the hospital Brayden stayed at). To participate, here is what you need to do. Please note it is important to put in the hostess information so you will receive the $5.95 shipping rate, no matter how much you order. Go to Tahnie's Stella & Dot website here, http://stelladot.com/tahnie Next, in the upper right hand corner, underneath StyleWatch, there is a link that says 'Can't make it to the trunk show? Find your hostess' click on that.You will then put in Jenna's Journey for the hostess information. Jenna's for the first name and Journey for the last, click search. It will say the party starts on August 17th and is in Pleasant Grove, Utah. Go ahead and click on Jenna's Journey, click continue and shop away! The last day to order is August 31st! 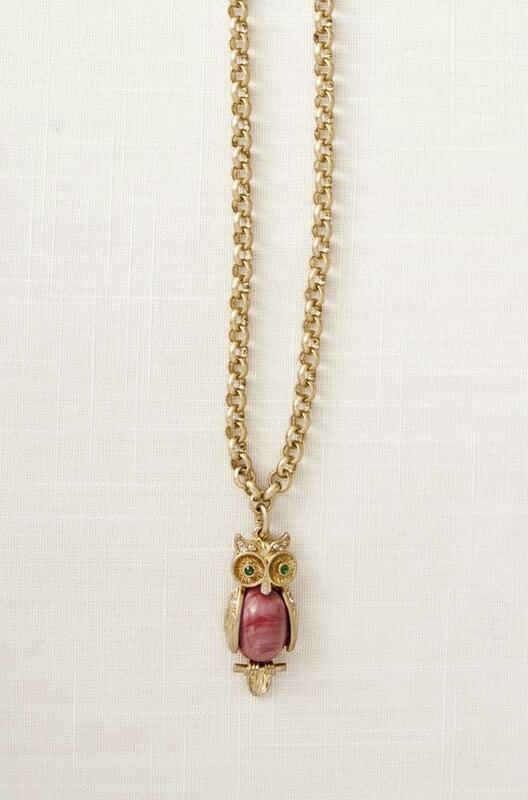 In addition to the trunk show I'm also hosting a giveaway for the below pictured Owl Pendant necklace! Here is how you can enter to win the pendant! For 1 entry, "Like" Tahnie's Stella & Dot face book page (just click here). For another entry, you can become a follower of my main blog (not this page; just click here). For 3 entries, blog, tweet (mention @Jenna05 so that I see it) or facebook about this giveaway! Please link to the post on my main blog. For 10 entries, let me know if you purchase an item through the trunk show. Be sure to let me know in the comments section how many entries you've earned! Good luck! Liked Tahnie's S&D Facebook page and facebooked about it on mine! Thanks for the entries. Love the little owl! Oh, I'm a follower & I liked them on Facebook! Hey,I like you on Fb! !I love your story and I am glad you are a mom!!! It's also great that you love to pick up strays and feed them too,I am a lot like that as well! Facebooked it, but I am not sure how to show you. #4 twitted and linked you to it, abivens2 is my user name. I already follow your blog (and love it)! I "liked" the facebook page. I follow your blog, I tweeted, I liked the fb page and I fb wall posted! I liked her facebook page, and I follow you, and I blogged about the giveaway! I joined her facebook page and I am a follower of your main page!